If you’ve ever worn crimson clothing or held a ruby gem close to your body, you know that red holds remarkable energy. While this hue is known for its empowering and invigorating qualities, though, you might not realize just how much power it holds. Discover the power of the color read, and learn how you can channel its energy. First and foremost, red is connected with the primary chakra point. Known as the root chakra, it’s centered at the base of the spine, near the tailbone. Given its location, it’s no wonder that the red chakra is closely linked with feeling grounded. As such, the root chakra has a large impact on your physical connection to the earth. It also symbolizes the blood that courses through your veins and helps your body thrive. Red also stands for passion, love, and intimacy, and its deep hue inspires intense connections, both mental and physical. 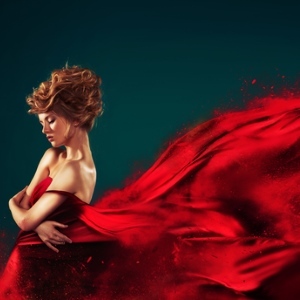 Red clothing, gemstones, and even hair color often stimulate passionate reactions. Many people report that both men and women are more attractive when wearing red, possibly due to a natural connection between the color red and the rosy glow of those with healthy circulation. While many people channel passion into love, intimacy, or other positive actions, this sensation can also lead in a negative direction. After all, red can also stand for agitation, anger, and even rage. If you feel as though you’ve channeled too much of the negative aspects of red, keep in mind that this hue can also represent a warning sign. Talk with a love psychic about your intense feelings, and learn how to channel them into passion, desire, and excitement. When you want to establish authority in the workplace, exercise influence in a relationship, or exert dominance while dealing with competitors, red can give you the upper hand. Try wearing a red tie or blazer when you’re negotiating for a promotion or emphasizing your leadership position in the workplace. To gain more authority in personal affairs, try wearing rubies or keeping rare red beryl close. Keep in mind that dark red tones have the strongest links to dominance, but pink and other rosy tones might not have the same effect. As a stimulating color, red inspires action and forward movement. That’s why it also signals achievement and success. When you make a habit of wearing red clothing, lipstick, or jewelry, you communicate both ambition and determination. Wearing red doesn’t just highlight what you’ve already accomplished, though. If you need an additional vote of confidence or the inspiration to break through barriers, wearing red gemstones or clothing can give you the additional power you need. From stimulation to dominance to success, red represents the origin of life and holds so much life-changing power. Make time for a psychic reading by phone to learn how to tap into this powerful sense of passion and authority, and make the color red work for you.